It’s no secret that I love rice, so much so that I cook and eat rice everyday and can’t even begin to imagine serving a meal without a side of Arroz. But hey, I’m a Latina, what can I say? 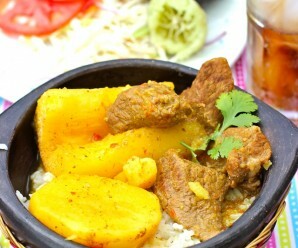 In Colombia and Latin America, we eat rice at almost every meal, in soups, salads, warm savory dishes and in desserts. There are endless recipes using this grain. Growing up in Colombia, lunch and dinner always started with opening up the lid of the rice cooker to reveal a steaming pot of fresh white rice. Rice was always the center of the meal, and it’s hard to put into words the comfort I find in a rice dish. 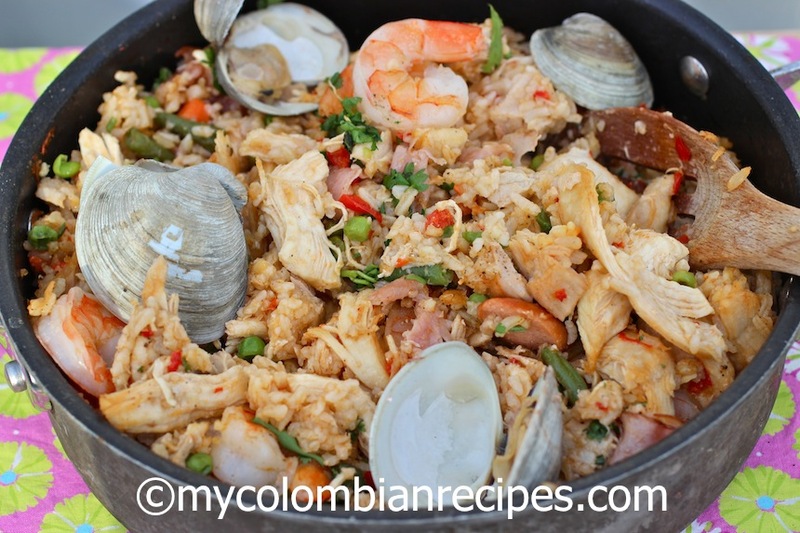 This time I used shrimp, clams, pork, ham, chorizo and chicken for my rice, but feel free to use your favorite kind of seafood and meat mixture for your recipe. 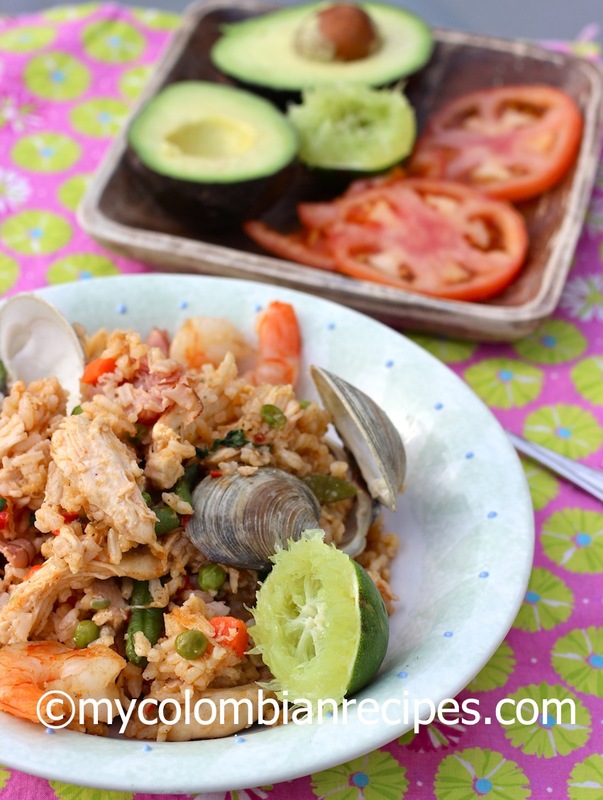 Also, I like to serve this Colombian-Style Seafood, Chicken and Pork Rice with avocado, lime wedges, tomato slices and hot sauce (Ají Picante) on the side. 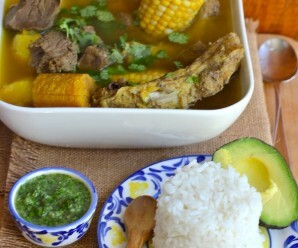 This is a wonderful one pot meal with fantastic flavors and textures, perfect to feed a crowd. 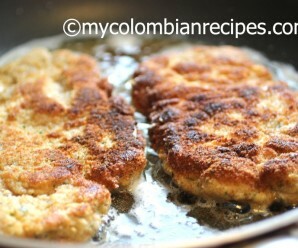 I hope you enjoy making and eating my Arroz Mixto Colombiano as much as I do. Buen provecho! lace the chicken breast, pork, 6 cups water and the remaining ingredients for the stock in a medium pot. Bring to a boil, cover and reduce the heat to medium low. Cook for 20 to 25 minutes. Turn the heat off and let the chicken rest in the pot for about 15 minutes covered. Let it cool, shred the chicken and pork, and set aside. Heat the oil over medium heat in a saucepan, add the rice, stir until well coated and cook for about one minute stirring often. Add the broth and salt, bring to a boil until the broth is evaporated, reduce heat to low, cover and let simmer for about 15 minutes or until the rice is tender. Remove from the heat and set a side. Heat the remaining oil over medium heat in a large sauce pan, add the onions, red bell pepper, green pepper and garlic, stir often and cook until the vegetables are tender, about 7 minutes. Add the tomato paste, cumin, achiote powder, chorizo, ham, salt, pepper and half of the fresh cilantro. Cook for another 5 minutes, stirring often. 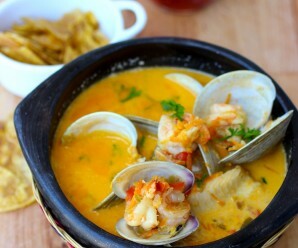 Add the raw seafood, stir and cook for about 3 minutes. 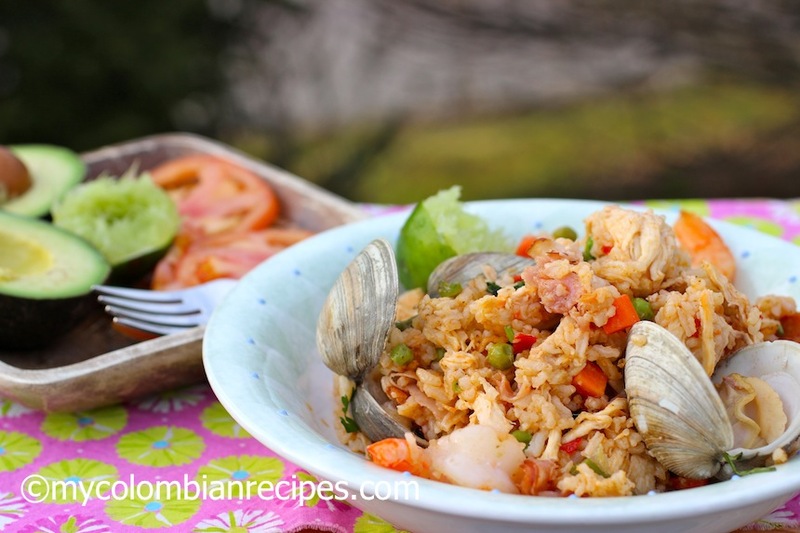 Add the cooked shredded chicken, pork, rice, peas and carrots, mix well and cook until the seafood is cooked, about 5 minutes. Add the remaining fresh cilantro, fresh parsley and serve. Love rice too. Your savoury rice looks so yum! 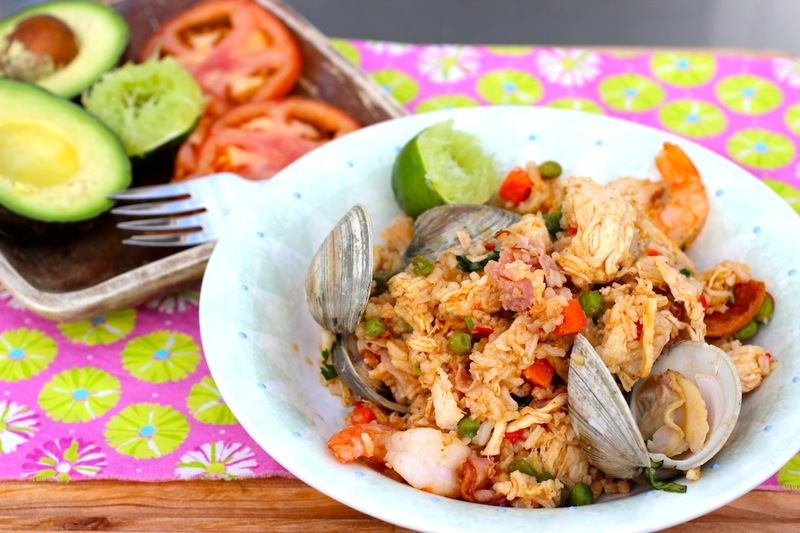 This rice dish sounds and looks delicious Erica…I love the combination of seafood with chicken and all the veggies in it…yum! That is a beautiful and stunning plate of food, Erica! My favorites: meat, poultry AND seafood 😀 This looks awesome and happy to learn the difference with Paella. Sounds very interesting. I would never have thought to combine all meat and seafood together. what a list of ingredients! they all come together so naturally though, and your finished dish looks and sounds tremendous! 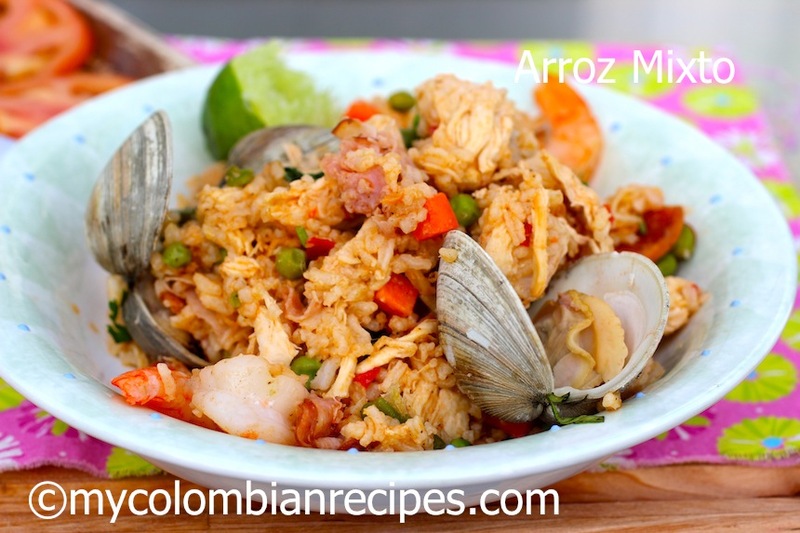 Then I prefer arroz to paella since I LOVE cumin and cilantro as flavors. Quick question – how many servings does this recipe yield? Would it be enough for a dinner party of 4?